"A Cheetah Cub's Tail" is a live stream of a particular litter of cheetah cubs known as "The Cubsters" at the Hoedspruit Endangered Species Centre (HESC). Salome, (our cheetah mother) gave birth to these 3 cubs on May 2, 2012. You can follow them on the stream daily as they grow, eat, play and prepare for their hopeful re-introduction into the wild. 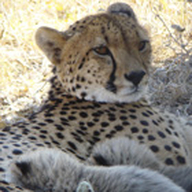 Cheetahs are by far the most endangered of the big cats in Africa. Breeding programs, like the one at HESC, are vital to expanding the cheetah's gene pool and helping to ensure the long term survival of the species.